All we have to do now is watch and wait. Mother Nature so far has let us down as far as winter weather events and I mean snow not ice. On the bright side of the coin, it hasn’t been too cold and we have had more sunny days than cloudy, and the heating bills have been low. Have a great day everyone. Thelma Lou feels the current winter pattern we’re in could have been stronger & from looking at those maps Christmas will more than likely be a wash out for most of the state, seems the white stuff wants to hold off til after the big day…but who knows right now, things can change. She says white Christmas chances 5.5%. I have been watching the GFS runs since last weekend. It is all over the place. Do we really want to see an ice storm in here for Christmas weekend. I say, lets make this plain rain and yearn for winter in the new year. FENCE!!!!!! And what side will you be on. Eight inches of precipitation for some. We are in for a wet Christmas unless the cold air can win out and if that happens KY just may get the most snow it has ever seen. Not getting my hopes up. Just watching and waiting to see if ole Mother Nature will do us a favor and give us a White Xmas. I am betting on the fence being set. Just hoping ice stays away. Mix and cold rain over that any day. Looks like ice and freezing rain and sleet could be a big issue along the boundary, wherever it decides to set up..gfs is all over the place yesterday had snow and cold today warm and rain..I gotta feeling the se ridge is gonna pump up the warm air when the artic front pushes deep into the plains..looks as if it it will push all the way deep into Texas. and if that’s the case and it decides to do so means the rain train sets up somewhere to the east of that..if the front stalls and doesn’t decide to head east south east into the lower Ohio and TN valley. Then guess who ends up on the fence.!?! The only big event we could see is ice or mix. Snow chances (beyond an ankle biter) seems to be mainly north of the Ohio river and to our east. That is not my guessing, but the weather outlooks that seem to be playing out so far this winter and CB’s own outlook appears to agree. Could be another year of missing the snow forecast though. Ok I’m thinking that high in the se Atlantic will get surpressed allowing the arctic air to invade way into the south keeping everything snow ice rain well south of kentucky. It’s all dependent on how strong that pesky SE Ridge is going to be. We probably want a wimpy ridge. Less Fencetucky then. More cold rain though, but better than the other potential option that comes with the fence. The stronger the SE Ridge is that puts us in the warm sector, just rain. The weaker the SE Ridge is the cold air will dominate and that will cause the issues of what exactly will fall from the sky. Rather it be sleet, snow, or freezing rain. Sorry, referring to the cold air placement in relation- If the overall flow is equal in energy we get the fence and more set-up potential for warm air aloft. Just making an observation, but the GFS ensembles showing show have been wrong since early October. They show the possibility of snow amounts, but we have yet to see anything near that. I know we are looking at trends, but this is just something i have noticed. That has been my observation as well, they are wrong the overwhelming majority of the time. This in example is why CB is less likely to call threat modes as in the past. I think last year is the first year since he had any form of blog where there was not really a threat mode. CB knew the models were bait and did not bite. CB simply posts about the models. but points out not a forecast. 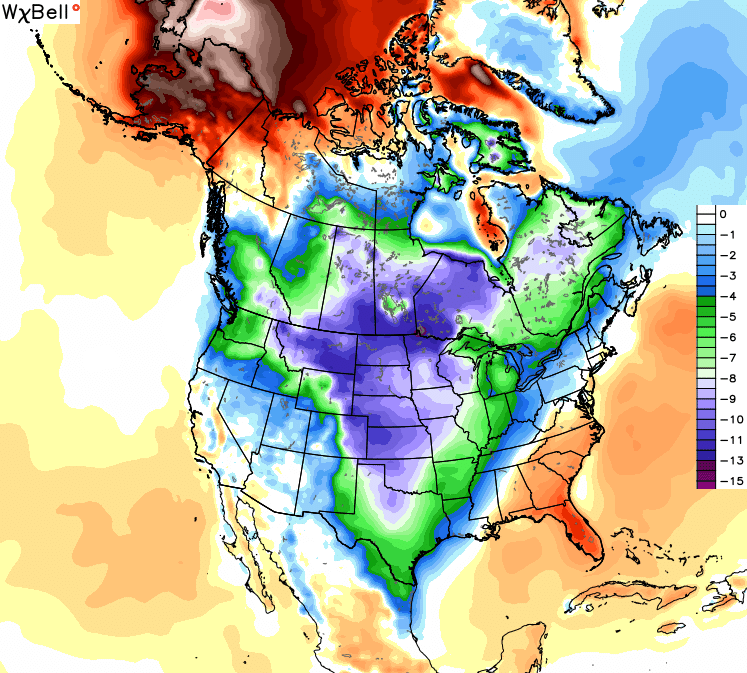 Ironically this winter could be the threat modes we would not want to have. That model looks like the same old tired pattern from the last few years. Couple days dry and cold followed by a warm up and rain then repeat again. It will be interesting to see if this SW to NE division between Arctic cold and SE Ridge will play out through Christmas. I would argue for a flatter almost W-E division, which would unfortunately introduce higher ice chances for our region preceded by lots of rain. I’m dreaming of a soggy Christmas! The last 2 GFS runs are actually showing something we can all believe for a change (and lets face it, when it comes to rain, its usually fairly accurate). Potentially flooding rains for the southern half of the state before and after Christmas and potential ice for upper for far northern counties. As usual, the SE Ridge is going to win and we can take that to the bank. The SE ridge always wins. Hopefully those nasty-looking pinks and purples stay north of the Ohio River. You would think with a stout EPO and the MJO going into a favorable position colder air would be more South East..Maybe modeling has this wrong also..lol..Anyways we all know the Euro like’s to hang energy back into the SW..But taking that bias into account we still will probably have some sort of a SE ridge..How strong is anybody’s guess at the moment.. While temps are cold the winds have been a no show in my backyard. That high pressure in the Atlantic ( Bermuda High ) is always there. This past summer, this high’s outer rim was the tract for the hurricanes. If this high moves into the southeastern part of the country, it will push the trough west. The question is how far west ? At this time and at this particular date no one knows. Something better change soon for the wetter. Folks, we could be in for a drought if widespread precipitation doesn’t show within the next two months. 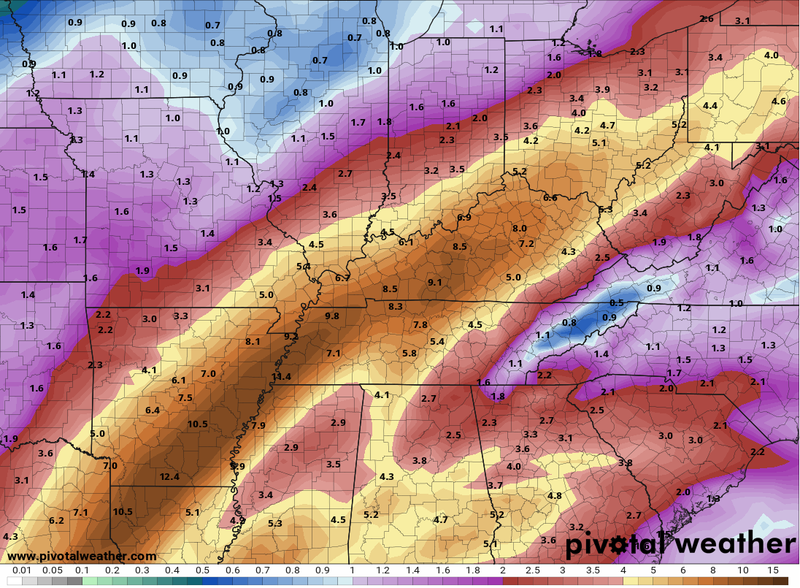 Oh don’t worry this upcoming storm system on Christmas week will have plenty of widespread precipitation. Yet another solution from the GFS..Complex situation for the model at this range..Too many moving parts..At least on this run the SER got beat down some..So maybe that will be a trend..
Looks like most of the forecasters and weather blogs on the internet are abandoning the cold for our area for the next couple weeks. Probably a warm/wet not a windy/white Christmas. Way to early in my opinion to abandon..Probably a week before models get an idea..Looking more and more to me though that someone is going to get ice..Where is the next question..Hope i’m wrong. The pattern? this past weeks pattern was supposed to be several clipper systems bringing some light snow, then looked interesting for friday..but really never panned out! I will say it was windy! The Pattern? 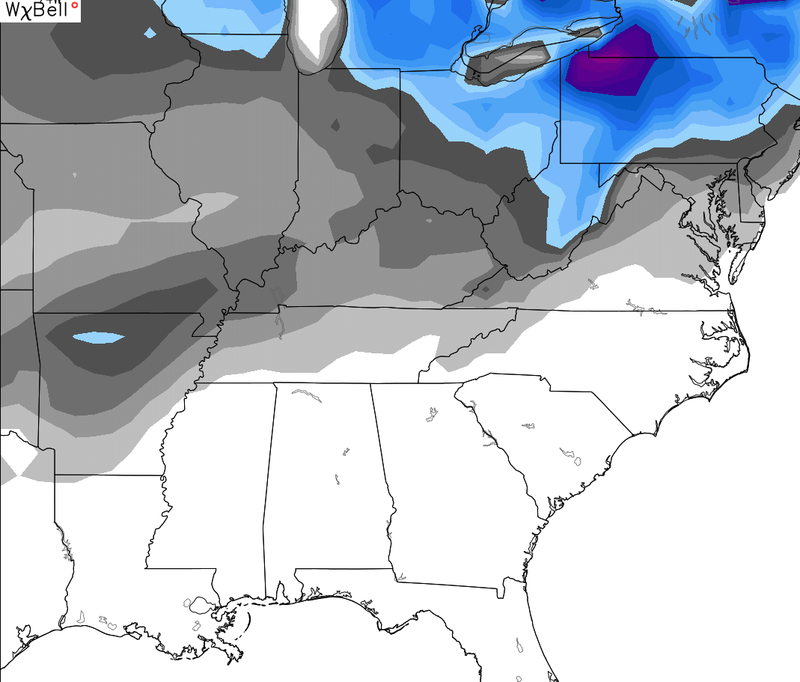 for the next week going into christmas…winter weather potential? 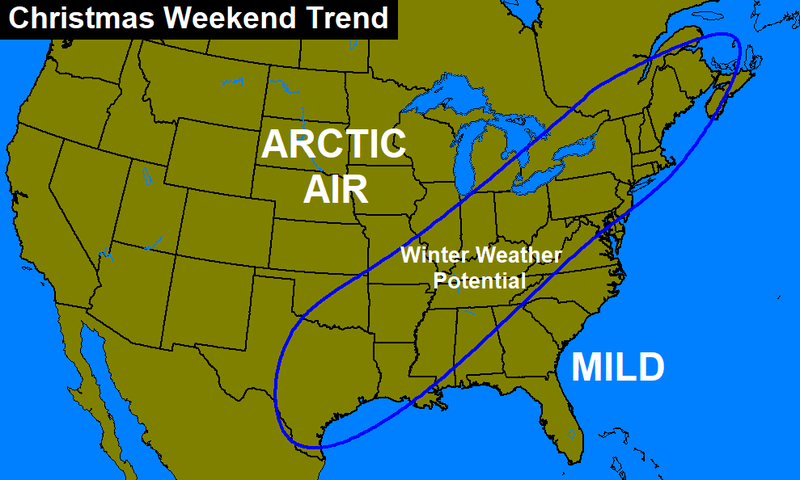 I believe we are trying to say the small probability of snow could happen. Large probability 45-50 degree rain could happen. Majority on here want it to snow! 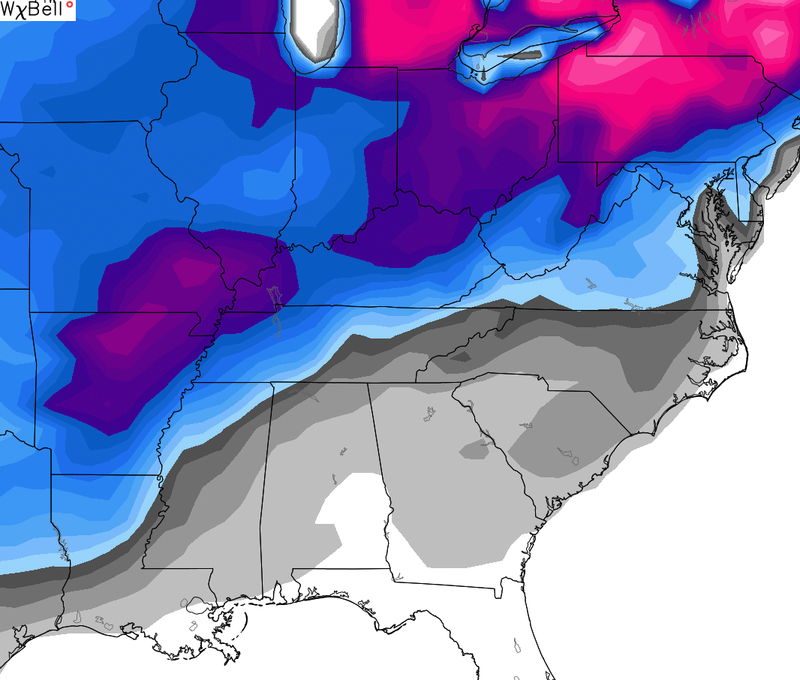 But models are for dreamers (and to some extent when I read Chris thoughts, it puts snowflakes in my eyes)…..reality we don’t have alot of white christmas….so I would bet with math and say pattern is only ACTIVE for some wind, cool rain. That’s what some would call pure speculation. It wasn’t speculation about this past week didn’t turn our to be all these clippers! It’s my opinion as a arm chair quarterback to see the models and trends would seem to me it’s pointing more to rain. Yes weather forecast is a science built on math calculations…but also is a Speculation of what may happen. I will say that Chris is the best out here for letting us know the potential!!! !